Many home gardens have an area of land that does not get a lot of sunlight—under a tree, perhaps, or in a corner of the fence where the sun does not penetrate. These shady areas do not have to be bare of color just because they are exposed to low amounts of sunlight. There are some flowering plants that will bloom and even thrive in shady conditions, according to Deborah L. Brown, a horticulturist with the University of Minnesota. 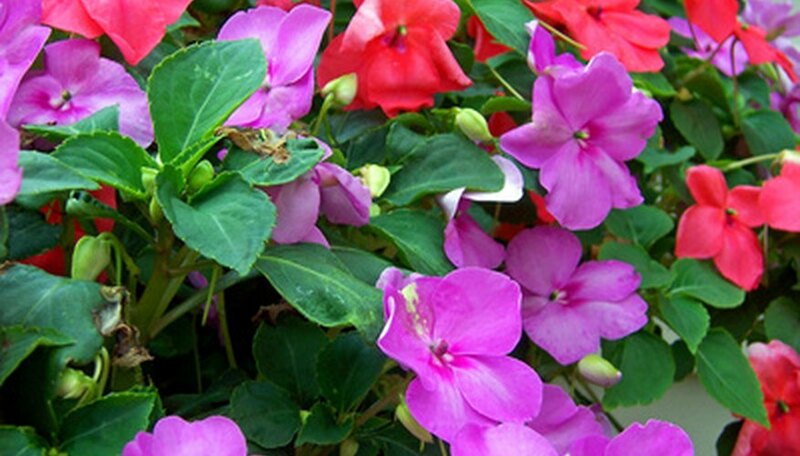 Impatiens are well known to most home gardeners. They can grow in almost any climate, from United States Department of Agriculture (USDA) Zones 4 to 10, and will bloom and spread all summer long with brightly colored flowers. Impatiens are annuals in most areas, as frost will kill them, but they can also be grown indoors as a houseplant year-round. Impatiens thrive in low sunlight. These plants do not tolerate hot sun very well and will wilt if exposed to a lot of bright sunlight, even if they are kept watered. Wax begonias are grown as annuals in all USDA hardiness zones save tropical and subtropical areas (Zones 9 through 11). Most varieties thrive in low sunlight areas, as the direct rays of the hot sun can scorch the succulent leaves of the plant. The flowers are white and shades of pink or red and will bloom from early summer to late fall if kept watered and deadheaded. Some varieties, such as the "Cocktail" series, have bronze-colored leaves that are especially attractive. Wild violets are small, bright, attractive flowers that are extremely hardy. They are so hardy, in fact, that they can become invasive and are sometimes considered to be a nuisance, according to Randall G. Prostak, a horticulturist with the University of Massachusetts. These perennials thrive in cool, shady areas and will naturalize quickly, spreading to carpet an area in purple blossoms. The foliage is evergreen even in freezing conditions. This plant is a good choice for forested areas under coniferous trees. Hostas are perennial flowering plants—they produce long, slender stems topped with delicate flowers—but the flowers are rather insignificant compared to the showy leaves of this plant. Hostas are usually planted for their colorful foliage rather than the flowers themselves. They thrive in shady areas and feature leaves that are solid or variegated, ruffled or smooth, heart-shaped or round, blue, green, cream or gold. Hostas are hardy in USDA Zones 3 through 8. Which Plants Grow in Low Light?